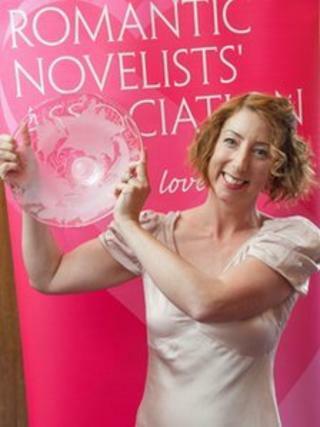 'Chick-lit' author Jenny Colgan has won the romantic novel of the year award with her 2012 book Welcome to Rosie Hopkins' Sweetshop of Dreams. The Romantic Novelists Association said it was a close competition, but said the Scot had won "by a nose" due to her "impeccable plotting and structure". The RNA judges praised the "element of surprise" in the book, describing it as "unusual in a romantic novel". Colgan's other books include Amanda's Wedding and Talking to Addison. Her novel triumphed over four other titles, all of which were named winners of individual categories in March. They included Mhairi McFarlane's You Had Me At Hello, winner in the contemporary category, and Charlotte Betts' The Apothecary's Daughter, adjudged this year's best historical romantic novel. Colgan, whose tome came top in the romantic comedy category, said she wrote the book in tribute to the sweetshops of her childhood and the works of James Herriot. The author, who currently lives in France, accepted her prize from best-selling historical novelist Lindsey Davis. Also presented at the RNA's summer party on Thursday was the Joan Hessayon Award for the best in new writing, won by Liesel Schwartz for A Conspiracy of Alchemists.